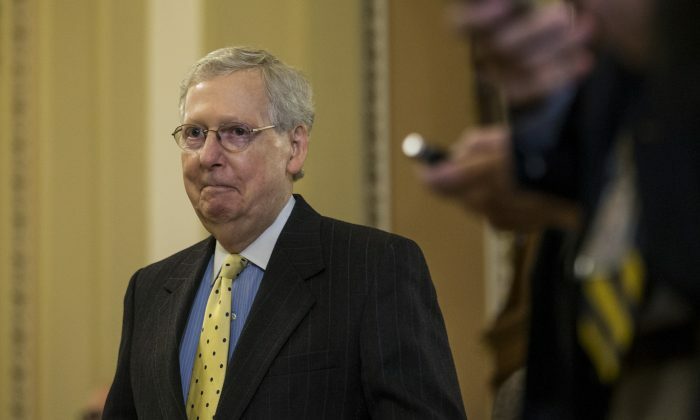 WASHINGTON—Senate Majority Leader Mitch McConnell won approval April 3 for a huge reduction in the amount of time the upper chamber can debate most presidential nominees, from 30 to two hours. McConnell, a Kentucky Republican, had to raise points of order after the Senate voted on cloture motions to limit debate on President Donald Trump’s nominations of Jeffrey Kessler as an assistant secretary of commerce and Roy Altman as a federal district court judge. Both of McConnell’s points of order were each sustained on appeal with simple majorities, 51–48, and the two-hour debate limit was established for sub-cabinet and federal district court judgeship presidential appointments. Prior to the points of order, Senate rules provided 30 hours of debate on a nomination if at least 60 members of the upper chamber voted in favor of cloture, the term for establishing a deadline for ending debate on a nominee. The two-hour limit was part of Senate Resolution 50, which was proposed earlier this year by Sen. James Lankford (R-Okla.) and was defeated April 2, when it failed to gain 60 votes on cloture. That failure became moot when McConnell’s actions on April 3 effectively enacted Lankford’s limit. Senate Rules Committee Chairman Roy Blunt (R-Mo.) also supported the Lankford proposal. Earlier in a day of rancorous debate, McConnell cited the Kessler nomination as “a textbook case study” of how Democrats had erected unprecedented delays on Trump’s nominees during the president’s first two years in office. “Jeffrey Kessler of Virginia was first nominated to serve as assistant secretary of commerce in November of 2017,” McConnell said. “It took seven months before Democrats on the finance committee allowed his nomination to be considered, but when it was, Mr. Kessler was reported out by a unanimous vote. Nobody opposed him on the finance committee. “And the familiar story continues. Another six months of inaction. The nomination was sent back to the White House at the end of the last Congress. So, the process started all over again. “This time, he got a voice vote in the finance committee. Everybody just said ‘aye.’ And yet, here on the floor, inexplicably, it has still required a cloture motion to break through the obstruction and get this unobjectionable nominee—that no one voted against—a vote. Democrats insisted the two-hour limit was unneeded and would damage the Senate’s tradition as the world’s greatest debating forum. “Two hours for a lifetime appointment is unacceptable. … It’s ridiculous, it’s a mockery of how this institution ought to work,” said Sen. Amy Klobuchar (D-Minn.). Similarly, former Senate Judiciary Committee Chairman Patrick Leahy (D-Vt.) defended his partisan colleagues’ delaying tactics as necessary. But in 2013, when President Barack Obama was in the Oval Office and Democrats under Senate Majority Leader Harry Reid (D-Nev.) controlled the upper chamber, a similar two-hour rule was agreed to with Republican support, led by McConnell. “In other words, a significant number of Republicans joined up with all the Democrats in 2013 to do something almost exactly like what we will be proposing later today, to help President Obama,” McConnell said prior to the Kessler proceedings on April 3. “That is comprehensive, across-the-board heel-dragging like nothing this body has seen before. It’s more than five times—five times—as many cloture votes on nominations as in the comparative periods for Presidents Carter, Reagan, Bush, Clinton, Bush, and Obama combined,” he said. “In other words, systematic obstruction. Not targeted, thoughtful opposition to a few marquee nominations or rare circumstances. But a grinding, across-the-board effort to delay and obstruct the people this president puts up. Even if they have unquestionable qualifications. Even if the job is relatively low-profile.